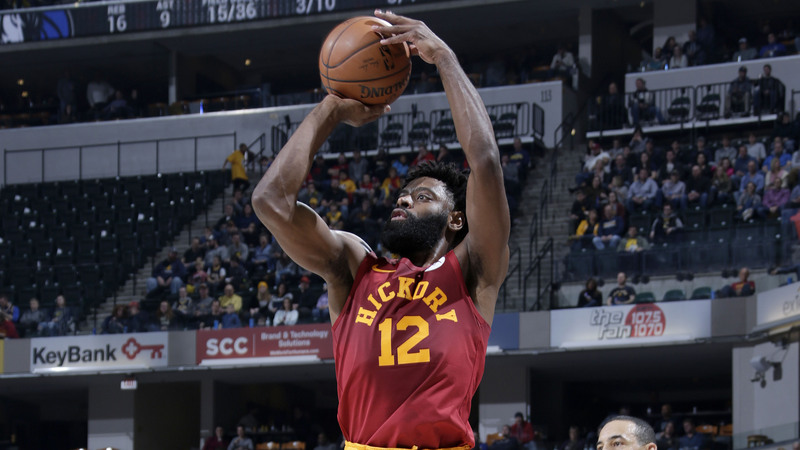 Jan. 19, 2019 - Pacers.com's reporter Zain Pyarali breaks down Indiana's 111-99 win over Dallas in which Domantas Sabonis and Tyreke Evans led the Pacers off the bench and Mavericks rookie guard Luka Doncic was held to just eight points from the stingy Indiana defense. 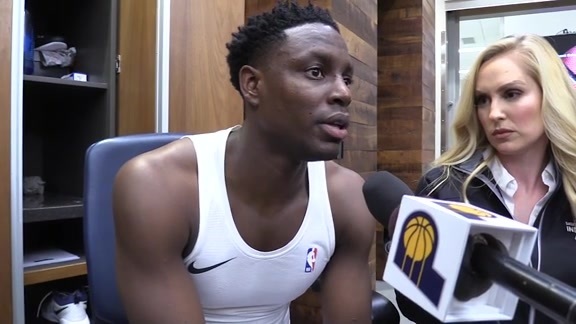 Jan. 19, 2019 - Darren Collison and Domas Sabonis discussed Indiana's 111-99 win over the Dallas Mavericks on Saturday night at Bankers Life Fieldhouse. 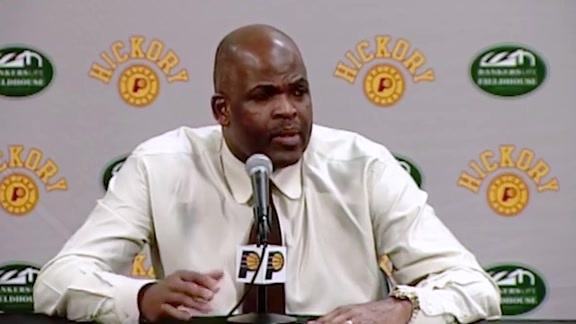 January 19, 2019 - Pacers head coach Nate McMillan spoke to the media following Indiana's 111-99 victory over the Dallas Mavericks on Saturday night at Bankers Life Fieldhouse. If it turns out that 21 NBA seasons are enough to quench Dirk Nowitzki's thirst, he didn't leave a favorable last impression for the fans in Indianapolis on Saturday. Most likely, however, the memories of all the others will override that one. Nowitzki missed all five 3-point attempts in the Pacers' 111-99 victory at Bankers Life Fieldhouse, three of them in the final 2 minutes, 43 seconds after the outcome had long been obvious. Fans groaned at every miss and booed his teammates who dared put up a shot rather than pass to him, hoping for one last accomplishment from the future Hall of Famer. "It was amazing," the 40-year-old said afterward. "Very humbling." Actually, the humbling part of the game was Nowitzki's shooting. The NBA's seventh all-time leader in career scoring looked more like a college walk-on who gets into the game at garbage time and tries to make a basket and delight the fans. Nowitzki has played in just 15 of the Mavericks' 45 games and is averaging 3.5 points on 28 percent shooting. He's hit just 24 percent of his 3-point shots, and had to hit three-of-six attempts in the two games before Saturday to get even to that meager level. Nobody's making fun, though. Nowitzki's accomplishments, work ethic and locker room presence are legendary throughout the NBA and should remind Pacers fans of their own legendary icon, Reggie Miller. Nowitzki has accumulated dozens and dozens of teammates in his career and left a great impression on all them, including two Pacers who once played for the Mavericks: Darren Collison and Doug McDermott. Nowitzki hasn't formally announced his retirement, but he doesn't have a contract for next season and his recent struggles — Saturday included — should be a motivating factor. Regardless, he'll always be a valid comparison to Miller, who lasted a "mere" 18 seasons with the Pacers, for dedication and discipline. The primary difference is that Miller had a better eye for the exit ramp, having averaged 14.8 points in his final season in 2004-05 and retired at 39. Rick Carlisle coached Miller as an assistant for three years and head coach for four. This is his 11th season coaching Nowitzki. He sees a lot of similarities between the two. "They're both great creatures of habit and they both have very stringent day-to-day rituals," said Carlisle, who talked briefly with Miller on Friday. "They're wacky and extreme at times, but they never change. Never change. They both have the same meticulous approach to shooting, the kind of preparation you have to do to be great and maintain that level of greatness. "The other thing is the fact in the big moments they've done all the preparation and have no fear. They wanted the ball and were only thinking of ways that ball was going to go in the basket. I think you'll find those two guys in the modern era are two of the greatest closers and makers of game-winning shots in history." They both also are/were locker room presences. Collison, who played with Dallas in the 2012-13 season, has distinct memories of Nowitzki. 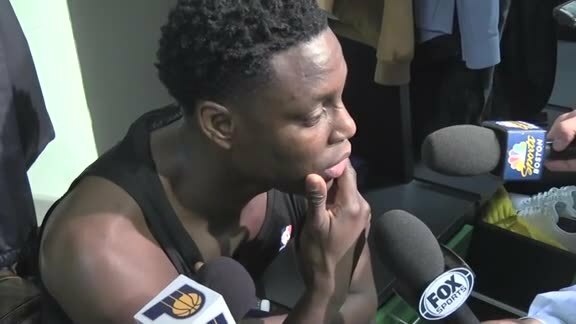 "How hard he works," said Collison, who scored 16 points Saturday. "Most players think they're working, but you get around a player like Dirk, he is constantly working. I'm talking about the evenings after you get to the hotel, he'll go back to the gym and work. In the mornings at shootaround, he's the last one to leave the gym." McDermott played 26 games for Dallas at the end of last season. That was enough to establish a relationship with Nowitzki, although the impression given is that one game is enough to do that. Nowitzki dubbed McDermott "Ames" in honor of his hometown on McDermott's first day with the Mavs, and was still calling him that on Saturday when they shared the court at the end of the game. "Unbelievable guy in the locker room," McDermott said. "Always giving guys advice. He was great for me, keeping things positive, keeping things loose. That's how he's been his whole career. Always giving jokes, doesn't matter who you are. He's always throwing jabs." The verbal jabs pack more punch than the field goal attempts now, though. 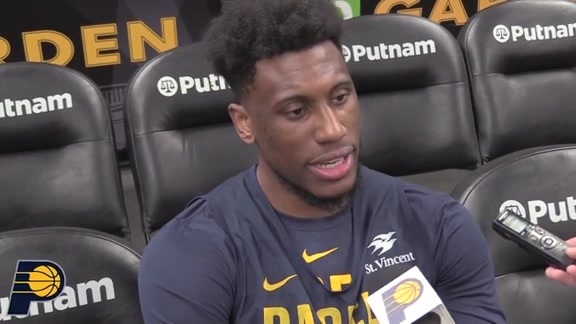 At the end, when the Mavs got the ball as often as possible to Nowitizki in hopes of just one meaningless-for-the-game but memorable-for-the-fans 3-point shot, everyone was trying to wishful think the ball through the rim – including Pacers center Myles Turner, who grew up in Dallas in Nowitizki's peak seasons. "Toward the end of the game, yeah," Turner said. "I wanted him to get one up." Turner meant get one in as well, but it wasn't to be. 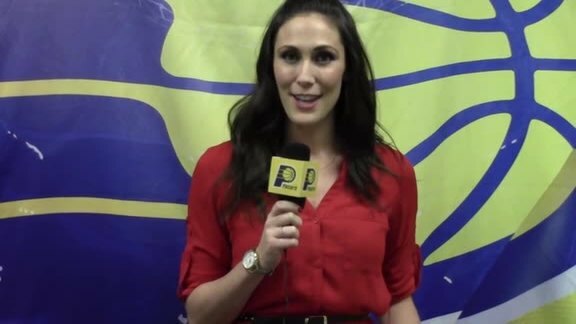 Nowitzki's didn't provide one (presumably) last shining moment for Pacers fans, but it doesn't matter in the long run. 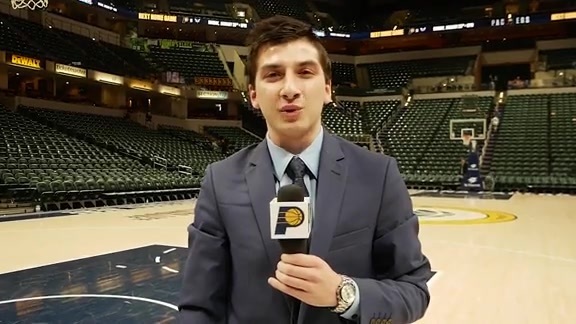 Nowitizki's long run against the Pacers stood at 34 games before Saturday, during which he had averaged 23.1 points on 48 percent shooting. What's five more misses? Nowitzki's predominant memory of Indianapolis is from spending a couple of weeks in the city in the 2002 FIBA World Championships. He led his native Germany to a third-place finish and earned MVP honors after averaging a tournament-high 24 points, which he considers one of the highlights of a career that includes an NBA championship with Dallas in 2011. 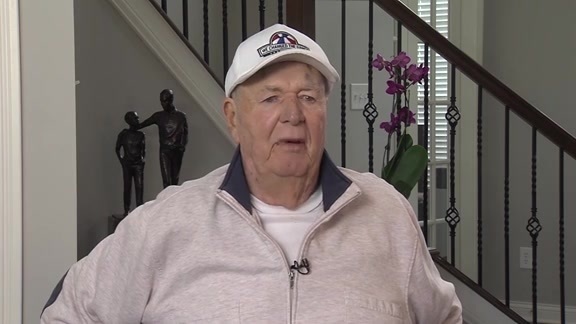 "I'll always keep Indy in fond memories from that," he said. As for all those games against the Pacers, nothing stands out. His first game against them came in February of 2000, his second season in the NBA. He hit a 3-pointer with 31 seconds left to give Dallas a four-point lead, but Miller later hit two free throws and got a defensive stop against Michael Finley on the game's final possession to preserve a one-point Pacers victory. Nowitzki said he doesn't recall that game. You can't blame him when he's played 1,486 in the NBAs regular season alone. "I don't remember all that," he said. "It's been an honor to compete against Reggie, though. I can always say I played against Reggie."